The Blue Devils may be the ACC's best chance at a third title in four years, but there are a handful of elite teams that could reasonably see themselves playing deep into March. Sports Illustrated’s 2017–18 preview is guided by data from our College Basketball Projection System, a collaboration between economist Dan Hanner and SI’s Chris Johnson and Jeremy Fuchs. We project teams on a player-by-player, lineup-based level and then simulate the season 10,000 times to generate our 1–351 national rankings and conference forecasts. These are the model’s projections for the ACC, including individual awards, the teams’ order of finish and (advanced and raw) stats for the top seven players in each school’s rotation. Can the ACC win a third national title in four years? There’s no reason to doubt the possibility, with Duke entering the season as the conference’s best chance at producing another champion. 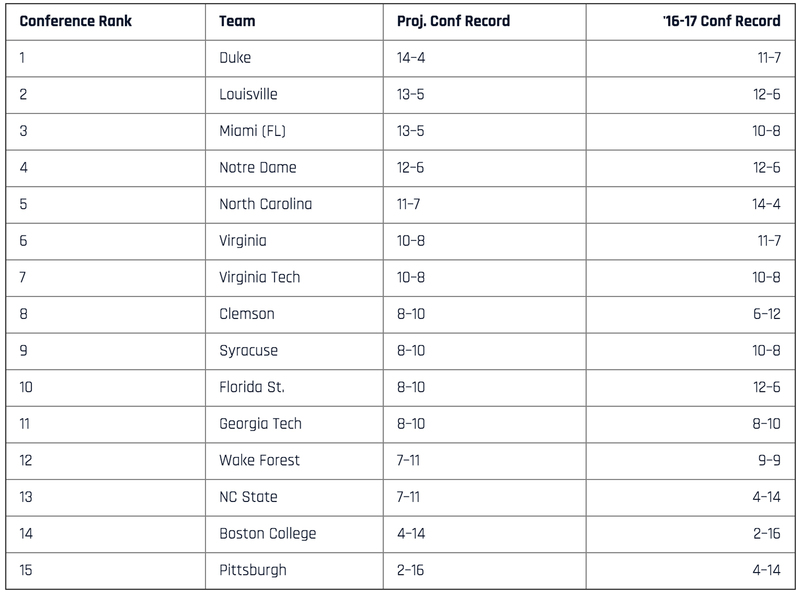 The Blue Devils will have their hands full in league play, however, as four other ACC teams land in the top 20 of our yet-to-be-released national rankings (no other conference has more than three). Despite the FBI investigation the program is currently embroiled in, Louisville likely stands as Duke’s toughest challenger, followed closely by Miami. The ACC Player of the Year race should be an exciting one, with Grayson Allen, Joel Berry II, Bonzie Colson and Marvin Bagley III all having a legitimate preseason case. The undersized Colson took a star turn for the Irish in his junior year and should carry the momentum over; he was the only ACC player to average double figures in both points and rebounds in 2016–17, and our projection system believes he will once again be the only one to accomplish the feat. If Duke lives up to its preseason hype, it will likely be because both Allen and Bagley are playing at an ACC Player of the Year level, but the presence of both sharing the scoring load in the Blue Devils’ stacked offense could pave the way for someone like Colson to take the league’s top individual honor. Just a few months ago you wouldn’t have found Bagley’s name on any preseason lists, as the freshman didn’t announce his intent to reclassify to 2017 until over halfway through the offseason. His subsequent commitment to Duke sent ripples throughout college hoops, and for good reason. The 6' 11" power forward brings a dynamic presence to the Blue Devils’ lineup and should shine at both ends of the floor as well as in transition. If he develops a strong on-court rapport with Allen and freshman point guard Trevon Duval, look out. The Blue Devils have four freshmen who were ranked in the top 12 of the Recruiting Services Consensus Index, led by No. 1 recruit Marvin Bagley. And that’s on top of a senior Grayson Allen, who is projected to lead Duke in scoring at 18.7 ppg. Behind Allen and Bagley, the Blue Devils’ dangerous offense projects as the best in the country, but their defense is much more of a question mark. The progression Mike Krzyzewski’s team makes on that end as the season goes could ultimately determine this young and talented group’s ceiling. Since the scandal that resulted in Rick Pitino’s firing broke, the Cardinals have suffered on the recruiting trail and suspended freshman Brian Bowen, but Louisville is still set up for a big 2017–18. Sophomore V.J. King looks poised for a breakout year, as we see him increasing his scoring output from 5.5 to 11.1 ppg. Freshman center Malik Williams will give the Cardinals an interior defensive presence and help anchor yet another elite Louisville D.
The Hurricanes return a higher percentage of minutes (67%) from last season than anyone else in the ACC, and they add No. 16 recruit Lonnie Walker to that mix. Walker is one of four Miami players we project will average at least 10 points, including the backcourt duo of senior Ja’Quan Newton and sophomore Bruce Brown. The Hurricanes should be improved offensively in 2017–18 and could boast one of the ACC’s top defenses, two reasons why they should land in the conference’s upper tier. Settle in for another year of a fun Irish offense spearheaded by Bonzie Colson and Matt Farrell. Projected to have a top-five offense in the nation, Notre Dame will either need to show defensive improvement from 2016–17 or hope it can out-gun enough of its opponents to make noise in the ACC. Guards Rex Pflueger and Temple Gibbs are both in line for bigger offensive roles, and freshman D.J. Harvey will be counted on to help fill the wing spot vacated by V.J. Beachem. The reigning champs are likely in line for a step back in 2017–18, but they still have the pieces to compete. Tony Bradley’s departure after one season left the Tar Heels scrambling for frontcourt depth behind Theo Pinson and Luke Maye, and an April commitment by Garrison Brooks helped plug that hole somewhat. Still, UNC’s strength will clearly be in its backcourt and on the wing, where Final Four Most Outstanding Player Joel Berry II returns for what could be a monster senior season and three-point sharpshooter Cameron Johnson arrives from Pitt. The Cavaliers will look different without London Perrantes running the show, but another crucial constant remains in that Tony Bennett’s team should once again have an absolutely dominant defense. In Perrantes’s stead, sophomore Ty Jerome and Rutgers grad transfer Nigel Johnson will be tasked with running the offense, and former top-40 recruit Kyle Guy could have a big year in his second season. The challenge for Virginia is finding enough scoring to take advantage of its suffocating D.
Right now, the Hokies are hoping they’ll get forward Chris Clarke—who tore his ACL last February and isn’t quite 100% yet—back sooner rather than later, but the junior’s exact timeline remains uncertain. Not having Clarke for a significant period of time would be a big blow to the team’s already thin frontcourt, as he figures to play a major role on both offense and the boards alongside Kerry Blackshear. The Hokies’ backcourt, however, is in much better shape and features a nice balance of upperclassmen and freshmen. The side of the NCAA tourney bubble Virginia Tech ends up on could hinge on whether it improves defensively. If things break right for the Tigers, they could potentially earn their first NCAA bid since 2011. Clemson will need to take advantage of a favorable conference schedule while junior backcourt duo Marcquise Reed and Shelton Mitchell look to lead the offense following the graduation of Jaron Blossomgame. The Tigers have an experienced roster and add Michigan transfer Mark Donnal, but will it be enough to sneak into the Big Dance? Sophomore point guard Tyus Battle should be one of the ACC’s top guards, but the Orange have a lot to replace around him after losing six of their top seven scorers. There’s definite talent on this Syracuse roster if Jim Boeheim can harness it, including four other former top-100 recruits after Battle. South Florida grad transfer Geno Thorpe was a bright spot for the lowly Bulls in the AAC and should do well in orange as well. This should be a bit of a rebuilding year for the Seminoles, who lost their top three scorers from a team that finished third in the ACC. They did bring in top-30 recruit M.J. Walker and top-60 recruit (and 7-footer) Ikey Obiagu, but Walker isn’t likely to come in and dominate as a freshman and Obiagu’s contributions right now are probably largely limited to the defensive end. Junior guard Terance Mann will be a reliable veteran presence. The Yellow Jackets were one of the biggest surprises in college hoops last year in Josh Pastner’s first season as coach, and sophomore Josh Okogie may be the most underrated player in the ACC. But Georgia Tech was held back by dismal shooting in 2016–17, and we project its offense to rank 184th in the country this year, making it difficult to see how it will take advantage of what should be an elite defense. Bryant Crawford, Keyshawn Woods and Mitchell Wilbekin give the Demon Deacons plenty of firepower in the backcourt, but Wake Forest has the opposite problem of Georgia Tech. The Wake offense should be fine, but the defense isn’t likely to produce at the level necessary to give the Deacons a shot at the NCAAs—especially in a league with so many strong offenses. After a disappointing year, the Wolfpack turn to a new era under Kevin Keatts needing to replace a lot of production. They added a pair of transfer guards in Allerik Freeman (Baylor) and Sam Hunt (North Carolina A&T), who will help alongside returners Abdul Malik-Abu and Torin Dorn, but it’s probably going to take Keatts more than one season to get NC State out of the ACC’s bottom tier. With just two total conference wins in the last two years, the good news for the Eagles is that we see them doubling that in 2017–18. Guards Jerome Robinson and Ky Bowman will put points on the scoreboard, and Illinois State transfer Deontae Hawkins is a solid piece in the frontcourt, but Boston College is likely still a ways off from making any significant improvement. After a major roster overhaul, the Panthers are poised to experience one of the biggest year-to-year drop-offs in the country. They have the nation’s lowest percentage of returning minutes (just 9%) and will turn to a cast of mostly freshmen and transfers in addition to senior Ryan Luther, who is projected to lead Pitt in scoring. It will be a long season for the rebuilding Panthers, who look destined to finish in the ACC cellar.